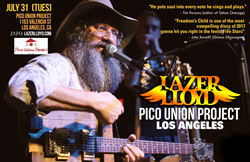 Lazer will play songs like his new hit single "Backstreets" (500,000+ streams on Spotify), cuts off of his new album "Freedom's Child" plus gems crafted on the road evoking the pain many are facing across the USA including "Help Is On It's Way", "Miracle". Lazer will play songs like his new hit single "Backstreets" (500,000+ streams on Spotify), cuts off of his new album "Freedom's Child" plus gems crafted on the road evoking the pain many are facing across the USA including "Help Is On It's Way," "Miracle." Unifying people and music along the way his new Americana anthem "Rock n Roll and Country Music," will lift everyone's spirits. The global viral hit "Tears for Dikla" featuring his soaring guitar will make memories for a lifetime. In addition to the deep musical groove, Lloyd enthralls his audience with masterful story-telling and hangs out to speak with everyone after the show - putting faces to the wonderful friendships started online. Dates/venues on his Summer tour include Main St. in Yorba Linda (7/29), Pico Union Project in LA (7/31), The Siren in Morro Bay (8/1), Mammoth Lakes Bluesapalooza (8/2), Nat'l Blues Museum in STL (8/3), Blueberry Hill Duck Room in St. Louis (8/4), the Ozark Cigar Box Guitar Fest (8/5), The Blue Door in Oklahoma City (8/7), VFW in Sweetweater, TX (8/8), wrapping up with an exclusive evening at Victory Gun and Guitar Works in Lindale, TX (8/9). Lazer will cap off the tour with two days recording with Chris Bell (Don Henley's "Cass County") in Wimberley, Texas at Blue Rock Studios. Recently he has played Third and Lindsley in Nashville, The Cutting Room in NYC, Fitzgerald's in Chicago, Hugh's Room in Toronto and has been featured on Red Hickey's Blue Plate Special (WDVX Knoxville) and Acme Radio Live (Nashville).